According to the author Gail Levine, inspiration to write this book came from her father who was an orphan at the Hebrew Orphan Asylum, the real life counterpart for the story’s fictional Hebrew Home for Boys. When Dave Caros’ father dies in an accident, his stepmother places him in the Hebrew Home for Boys; an orphanage also known as the HHB or, not so affectionately, the Hell Hole for Brats. There Dave must contend with an abusive superintendent and older bullies. Luckily, his roommates, a tight-knit group called the “elevens” (they are all eleven years old) are all “buddies” and look after each other. Dave, an active boy known for his penchant for getting into mischief, refuses to be hemmed in by the walls of the orphanage. One night he finds a way to escape the orphanage, but instead of running away, he vows to return to the orphanage to get back his precious carving of Noah’s Ark made by his father and stolen by the superintendent and to help his fellow elevens. 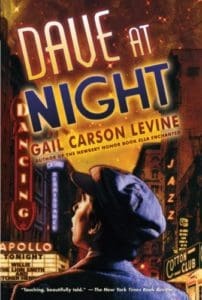 So starts the story of Dave’s days at the orphanage and his nights in Harlem. Once outside the orphanage he befriends Irma Lee, a girl his age that is the niece of a wealthy African-American socialite and Solly the Gonif along with his smart aleck parrot. Irma Lee and Solly introduce Dave to Harlem’s vibrant nightlife filled with rent parties, fortune-telling, Jazz music and a host of up-and-coming artists, musicians and writers. Through his adventures and misadventures, Dave learns to turn his anger and sense of loss and betrayal into a force for helping others, making friends and discovering his own worth and talents.